The stars at night are big and bright - deep in the heart of Northumberland! Today (Monday, 9 December, 2013) England's spectacular Border county has been named as home to the largest area of protected night sky in Europe. The International Dark Skies Association (IDA), based in Tucson, USA, has granted Gold Tier Dark Sky Park status to the combined areas of Northumberland National Park and Kielder Water & Forest Park – covering nearly 1,500 square kilometres of breath-taking scenery between Hadrian's Wall and the Scottish border. The new zone - which will be called the Northumberland International Dark Sky Park (NDSP) - is the first of its kind in England and one of the largest in the world, joining the likes of Death Valley and Big Bend Dark Sky Parks in the USA. Gold tier designation is the highest accolade that the IDA can bestow. Working with councils, residents, businesses and tourism agencies, the two year campaign to achieve the prestigious status has been spearheaded by Northumberland National Park Authority, Kielder Water & Forest Park Development Trust and Kielder Observatory Astronomical Society. Bid chiefs say the move will counter the spread of light pollution and maintain the pristine starry skies overhead. It will also help develop sustainable astro tourism, boost nocturnal wildlife and create a model for high quality, safe and eco-friendly public lighting. Crucially, it will also protect the rural character of an area deemed the nation's darkest and most tranquil by the Campaign to Protect Rural England and provide opportunities for people to be inspired by the stars. "We have worked so hard together to reach this tremendous day for everyone committed to securing protection for England's largest area of starry skies. We have a wonderful story to tell in terms of our public astronomy outreach and the success of the Kielder Observatory. But this designation as Europe's largest Dark Sky Park will be a springboard allowing us to do even more. We do not want to turn off the lights, but rather encourage better lighting using the latest technology. This is the start of a new chapter for Northumberland where quite literally the sky is the limit." "I'd like to offer warm support to this development. It is a further boost for Kielder Observatory and stargazing throughout Northumberland National Park. But, more than that, it should have the support of a far wider community than astronomers. The dark night sky is the most universal feature of our environment. All humans, everywhere in the world and throughout history, have looked up at the sky and wondered at it. This experience is now denied to most people, because of the background light in towns and cities. It is important to ensure that there will be somewhere in England where young people can fully enjoy a cosmic panorama." Northumberland Dark Sky Park has been created from two adjoining areas - Northumberland National Park and Kielder Water & Forest Park (where the Forestry Commission manage England's largest forest and Northumbrian Water Europe's largest man-made reservoir). The joint bid is the first of its kind approved by the IDA. Over 300 light meter readings have been taken over a two year period by National Park volunteers, amateur astronomers and Forestry Commission rangers, confirming Northumberland retains England's largest extent of starry skies due to low levels of light pollution. An audit of external lighting was also undertaken to identify lights which need replacing or adjusting to comply with and exceed IDA guidelines. A new Lighting Management Plan will guide planning authorities in ensuring new developments take account of the pristine night sky. The park's darkest areas, which are mostly uninhabited, will remain light-free. Northumberland County Council has supported the bid and together with Northumberland National Park Authority has endorsed the Lighting Management Plan. A £25m ‘Invest to Save’ project is set to get underway next year to replace up to 16,000 street lighting columns and replace all the existing sodium lanterns with eco-friendly and fully controlled LED units, with the capability to vary the lighting levels, while maintaining public safety. This will significantly reduce light pollution, slash energy and maintenance costs and cut carbon emissions. A major catalyst for the Northumberland Dark Sky Park initiative has been the phenomenal success of the Kielder Observatory, perched 1200 feet above forest and moorland in Kielder Water & Forest Park. Since the £510,000 facility opened in 2008 it has welcome over 50,000 visitors, eager to experience celestial wonders above this ultra-dark location. "The IDA are delighted to recognise Northumberland Dark Sky Park as the latest addition to our family of International Dark Sky Places. The quality of Northumberland's night sky, and the huge efforts made by local communities to preserve them, make Northumberland Dark Sky Park a Gold-Tier site, and one of the best places to stargaze in Europe." 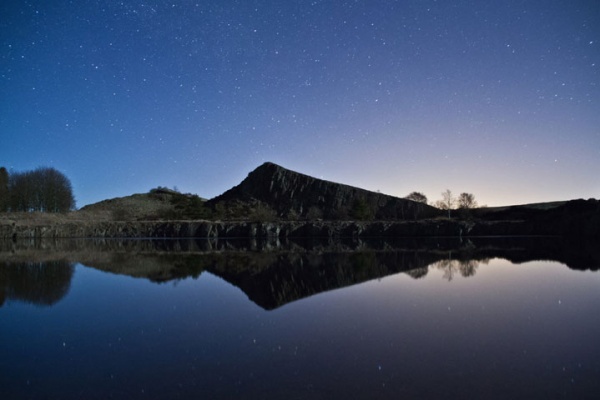 More Dark Sky Discovery Sites will be created across Northumberland Dark Sky Park, providing places like Cawfields, managed by the Northumberland National Park, on Hadrian's Wall, where people can pull in and admire the heavens aided by on-site interpretation. A total of 13 potential sites have been identified. An ambitious astro outreach project will also be announced shortly, involving support for training businesses, visitor collateral and development of event deliverers across the NDSP and wider area. Further business workshops are also planned to encourage enterprises to tap into the public appetite for stargazing. Hotels and guest houses in the county are already offering dark sky breaks. Northumberland Dark Sky Park videos and picture gallery (you are free to download for publication, or link). Please credit where stated. "The site of Kielder observatory is a truly magnificent dark sky area. Having filmed an episode of The Sky at Night there, it was incredible witness light levels fall to such a depth that you would swear the stars were casting shadows. ….It's a sad thought that such genuinely dark sky sites are becoming increasingly rarer. We must value them, preserve them and ensure they can be enjoyed by as many visitors as possible who may take in the majesty of a spectacularly non-light polluted night sky"
When the Dark Sky Park lighting audit was undertaken in the village of Greenhaugh in November 2012 Greenhaugh First School, near Bellingham, was identified as having unshielded exterior bulkhead lights which were not compliant with IDA standards. In response the school has established its annual own ‘Dark Sky Day’ where they integrate aspects of the dark sky into their curriculum, as well as participating in observational activities. Youngsters have since designed their own light shields, which are now being installed to make the whole building compliant and dark sky-friendly. The College Valley, near Wooler is the most remote and unspoilt valley in Northumberland National Park. It is owned and managed by the College Valley Estates, who also run a number of self-catering cottages. The lighting audit identified a number of errant bulkhead lighting units installed on some of the cottages. Following discussions with the Estate, a number of lighting units have been adjusted and a plan is now in place to replace others with new shielded low-wattage units and promote the Estate as a dark sky friendly destination within the National Park. Northumbrian Water is reviewing its lighting stock across all their sites in the North East of England, Suffolk and Essex. They are running pilot schemes on potential dark sky discovery sites in Northumberland with a view to identifying suitable dark sky friendly lights which can then be tested for other locations. Northumbrian Water manages Kielder Water - Europe's largest man-made lake, which lies in the heart of the Northumberland Dark Sky Park. Forestry Commission's Kielder Forest Depot, a major operations base to managed England's largest man-made forest, was also a major source of local light pollution, with nine security lights fitted and switched on through the night. These have been replaced by motion activated LED lights which are fully shielded. The result has been less intrusive lighting for nearby residents, better protection for the starry sky overhead, and a significant energy cost saving for the Forestry Commission, which is also committed to reducing its carbon footprint. As a result of the change, security has actually been improved, with lights activated after detecting movement in the local area rather than permanently illuminating potential targets for burglars. 3. What Dark Sky Park status means for residents? Northumberland Dark Sky Park (NDSP) extends across 1570 square kilometres. The Lighting Management Plan will guide the two planning authorities (Northumberland County Council and the Northumberland National Park Authority) in considering planning applications and also provide a tool to continually improve public lighting so that it is more effective, less polluting and more energy efficient. The NDSP has been zoned with different planning guidance. For the west of the park, centred on the mainly uninhabited areas of Kielder Water & Forest Park, the guidance is that no new lighting should be permitted so this pristine area of darkness is preserved. Settlement areas such as Kielder, Stonehaugh, Byrness and villages in the Northumberland National Park like Esldon and Greenhaugh, have less strict guidance taking account of the need for safe and efficient public lighting. The aim here is to encourage lighting which shines where it is needed, rather than into the sky. 5. The Northumberland Dark Sky Working Group co-ordinated the successful bid for dark sky status from the IDA. It comprises Northumberland National Park Authority, Kielder Water & Forest Park Development Trust, Kielder Observatory Astronomical Society, with representation from Northumberland County Council, Visit Northumberland and local parish councils. 7. Kielder Water & Forest Park Development Trust is a registered charity working to develop the Park as an inspirational place. It aims to improve economic, social and environmental sustainability, provide public recreation and leisure facilities, facilitate education in all aspects of the natural environment and advance art and architecture in the Park. The Trust works with the range of communities to benefit from these activities. Members, who have appointed directors/trustees to serve on the board, are Northumbrian Water, Forestry Commission, Calvert Trust Kielder and Northumberland County Council. Affiliate organisations that are not members but have a close working relationship with KWFPDT include Arts Council England, Northumberland Wildlife Trust, Environment Agency, The Scout Association and local decision making bodies such as the parish councils.